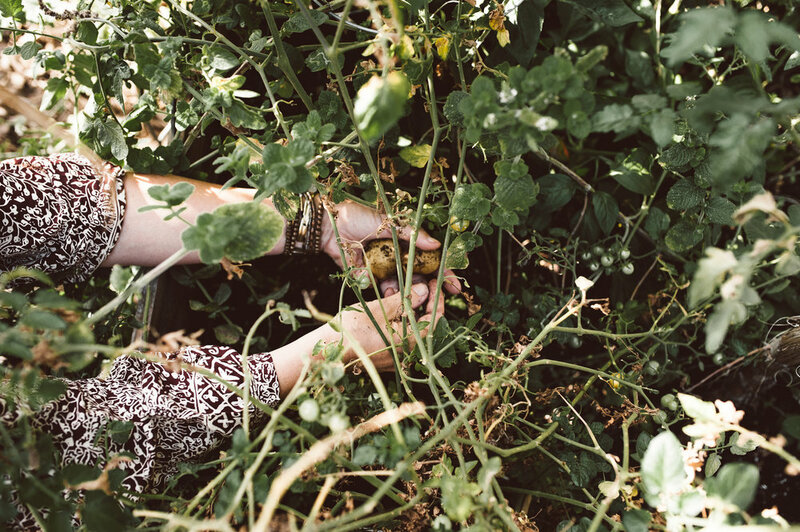 A History of Gardens — Wayward Roots & Co. It was a evening along the fringes of summer, the edges of the world lined in gold with the slightest ting of chill in the air. 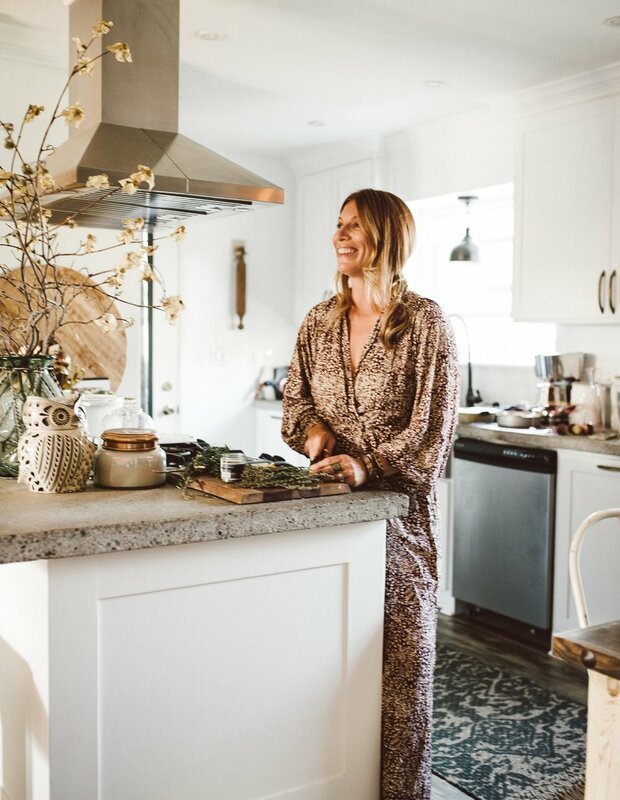 Upon stepping into the home of Corey Villicana in San Marcos, California, we were instantly wrapped in a blanket of rosemary, candles, and warm broth making its way from the kitchen. Her entryway walls are lined with dozens of photographs of family and friends, blended with an eclectic collection of paintings that captivate the curiosity of visitors as they move into the space, making the essence of those that inhabit the home known. Cozy chairs and blankets fill the living room, inviting you to curl up and stay a while. As we make our way to the garden, the light pours over the yard. A long farmhouse table topped with lanterns and cactus sits in the center of the yard; a gathering place for this home with an open door policy among their community. 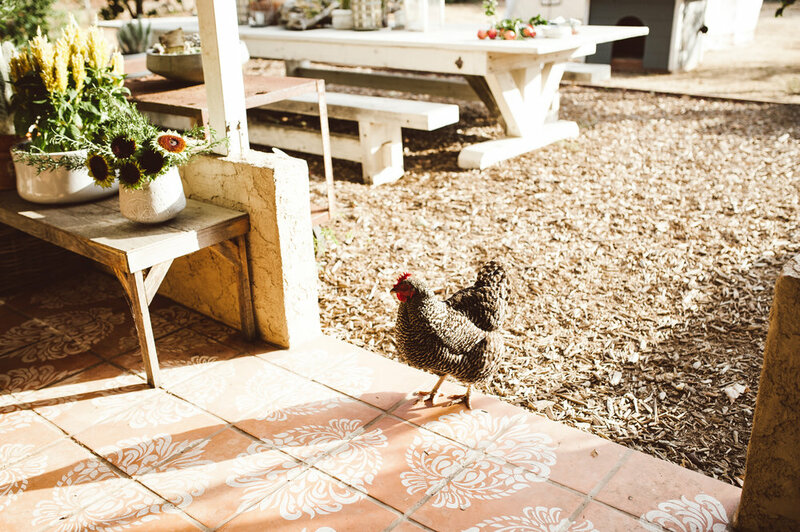 The garden beds lie filled with the current season's produce, fruit trees hanging low with their ripening yield, chickens wandering to and fro in search ground morsels, her dogs wandering between us looking for a friendly ear scratch. Being in an urban setting, you can hear the light hum of traffic from the nearby intersection, yet feel at ease in this garden sanctuary. It is a merging of two words, the one in the same, yet apart; harmoniously mingling and cohabitating. 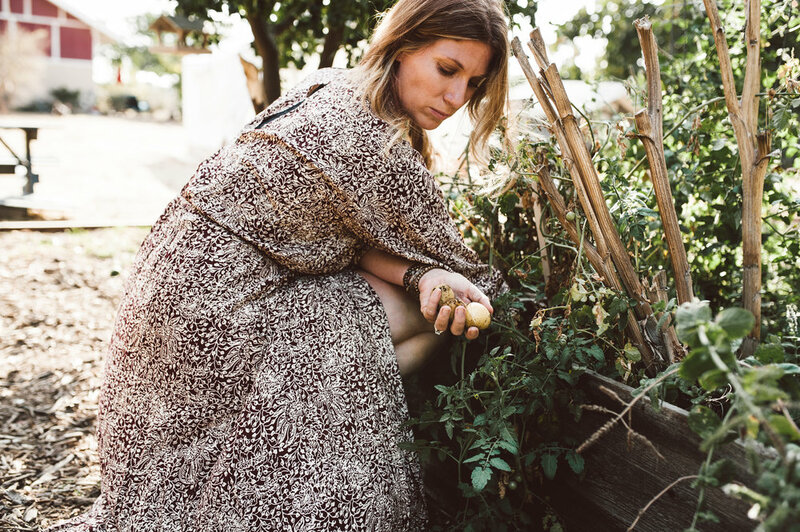 Corey is a photographer, videographer, stylist, mother wife, friend, sister, daughter, food lover, hostess, and small urban gardner living and working in San Marcos and the greater San Diego area. Corey graciously opened her home to us to share food and stories of time amongst the tended gardens throughout her life. Could you describe your motivations to begin gardening? How long have you been actively gardening and in what ways have your ambitions evolved and/or expanded? For as long as I can remember, the women in my family have had their hands in the soil. Flower beds and vegetable gardens were a large part of my childhood and have remained that way thought my adolescence and well into adulthood. The gardens that most influenced me early on were my mother's gardens, and my mother's mother's garden, my nana. My mother did and still does keep a large scale food-based garden, growing fruits and vegetables, as well as seasonal varieties such as pumpkins and artichokes and at one time, many years ago in our childhood garden in Idaho, a large crop of cannabis. My nana’s gardens were quite different as she was a lover and cultivator of florals, using many of her own flowers in her floral arrangements and artistic works. I was lucky to have visited my mothers childhood home in Maine three summers ago and my nana’s prized gardens were still in place. I imagined her there in that space all those years ago, tending to the garden as her children swirled and played at her feet, that was a pretty remarkable experience; I felt her spirit there. Her last garden was planted here on the coast in California with a view of the Pacific Ocean. If I close my eyes and allow myself to, I can still see her out there clipping and weeding. 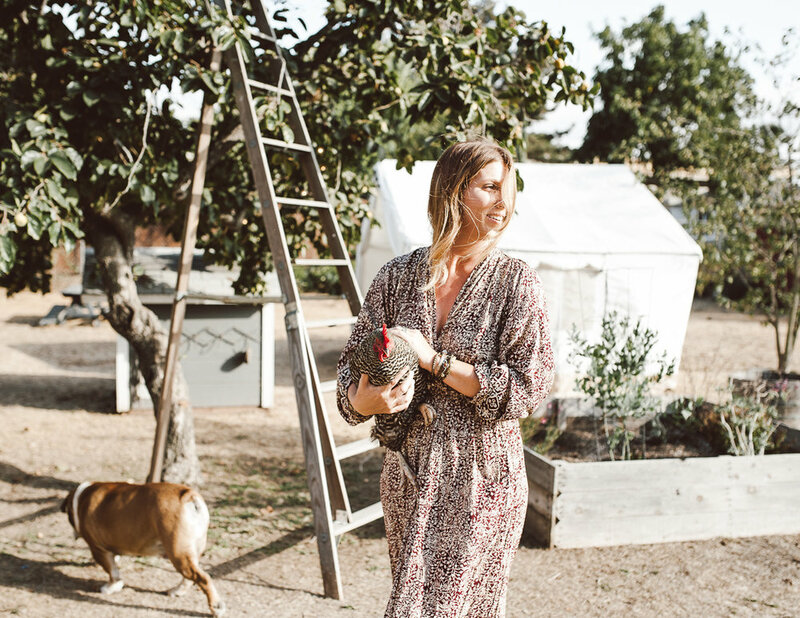 My motivation early on was to create a space where I could grow organic food for my family to eat and enjoy and involve my two sons with the process of growing and cultivating their own food. I think in a world where faster seems to be better and instant gratification is a subset it is important to remind ourselves of the true processes of life. The planting of a single seed, the care and attention it takes over days and weeks, sometimes months, before reaping the benefits of its fruits or blooms. That is important. That is a much larger lesson than the actual seed and fruit. Imagine, taking the time to slow the daily process, allowing yourself the time and nourishment that you need to flourish. Enough water, nutrients, sunlight, rest. The adequate amount of time to root yourself, to grow and then, ultimately, when the time is right, and the work has been done, to bloom, outwardly sharing the benefit of the the time and effort it took to do so. I think about that a lot. How does living in an urban environment influence your practices and motivations towards gardening? I love thinking of myself as an urban farmer. Living in an urban environment allows me to have the necessities and resources for gardening and farming available at my finger tips, but still allows me the space and capability to define my practice as my own. I have accessibility to family owned and opperated feed stores and offbeat nurseries to shop from. I make a practice of driving the backroads and making connections with the small business owners in my area. I learn their names and make a conscious investment into their business. Then when I’m planting or eating something that I've bought from them, I can say to myself or to someone sitting beside me,“This is Ms. Sarah's broccoli. I know her. She’s tangible. She has three daughters and two dogs"- you know stuff like that. I have multiple raised bed gardens throughout our property that my father-in-law built throughout our yard for me as a gift years ago. I cherish them. I also started raising chickens nearly two years ago now. I dream of one day having a CSA of our own and ultimately living on and operating a self sustaining pizza farm; an idea that came to me while traveling on the east coast years ago. I think that living where we do allows the opportunity to do just about whatever you’d like. I was talking with a chef of a local restaurant recently about our chicken eggs and he expressed that he would be interested in duck or turkey eggs to use in his kitchen if they were ever available. That piqued my interest and excited me at the thought of being able to take my family and friends to an amazing meal in a beautiful space and knowing that our efforts played a part in someone else's vision becoming a reality and provided someone with something thats missing in the local marketplace. That connection to our community and the fostering of shared value relationships means a great deal to me. 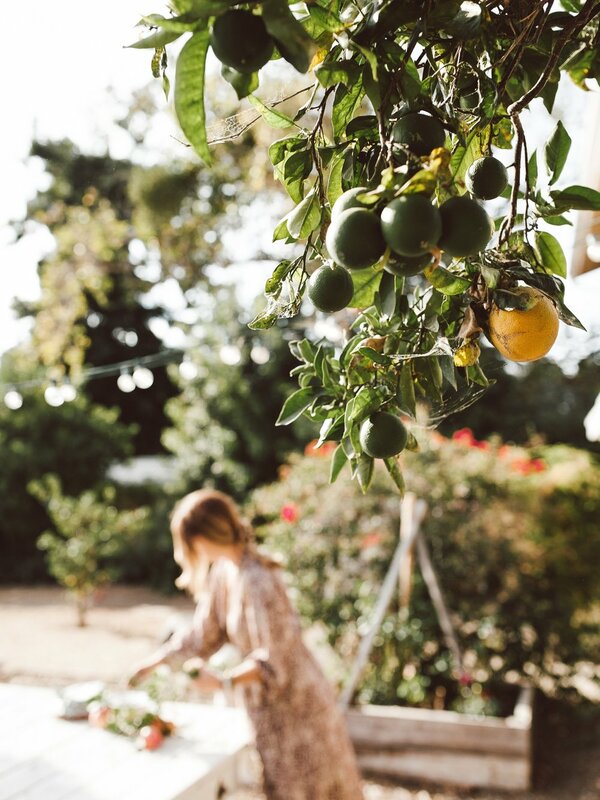 In what ways does your family contribute to the garden with you? Do any of your other family members have an inclination or connection towards gardening? I have two sons, and as young children, they would spend time with me in the gardens, digging and planting, watering and tending. But to be honest, at this stage in life of adolescence, they aren’t as invested as they once were. I know that they know what a great deal it means to me and they both take great pride in the food that our gardens produce. They get excited every year when we cut and prepare our own artichokes, squeeze our own orange juice and make weekly egg deliveries to their teachers at school. One of my favorite memories of my boys in the garden is them picking and chewing sprigs of mint while playing in the yard- that still happens. When they have friends over and offer them a piece and an explanation of what it is and how it's grown, I know that feels good to them. During our visit, you mentioned your mother sending you and your sister seeds she saves, as well as seeds passed down from you grandmother. Can you elaborate on this story? 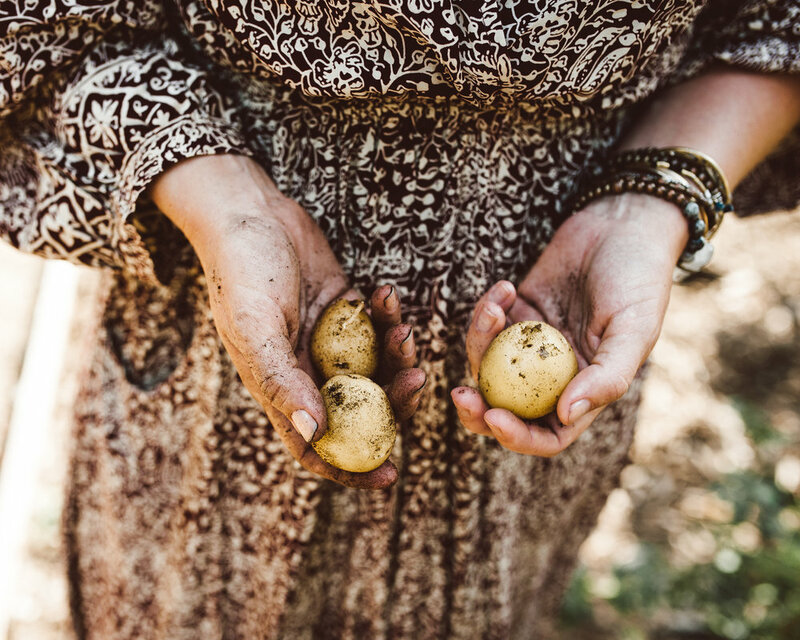 How has it influenced your connection to gardening and food? The practice of saving and sharing seeds, bulbs, and starts has been taking place within our family for generations. Both of my grandparents on my mothers side came from big farming families, dating back to the 1700’s in Illinois. My grandfathers father, my great-grandfather, was a John Deer salesman with seven children and a wife to feed. Much of their food was homegrown. It has always been explained to us that it was both a necessity and a pastime. My great-grandfather, after retiring, spent much of his time in my mother's childhood garden until he passed away at the age of 90. My nana would tell stories of traveling around town with a bucket and a shovel in the car just incase she saw something that she needed. So this exchange of goods has been years in the making. Heirlooms are often archived and accompanied by handwritten care instruction, these seeds and their yearly above soil return are some of my most prized possessions. When my nana passed away some twenty years ago, my mother went to her garden and spent time clipping and uprooting a multitude of bulbs and starts that she then took home to her own garden and replanted. There is a certain connection within those transplants, to the person that so thoughtfully and meticulously cared for them. You feel that you can’t help but do so. Once my sister and I had homes and gardens of our own, my mom then gifted us with some of the bulbs and starts from those clippings that she planted all those years ago. So every spring, I have my nana’s spinach to cook with and share with my family, which in actuality was probably her mothers or her mother-in-laws spinach to begin with. Then in the winter I have her paper whites that spring from the ground, reminding me of her endlessly with their sweet, pungent aroma. So on and so forth, I have my mothers blackberries and artichokes and and a multitude of others things. And one day, my boys will have them too, and God willing, their children one day. This deep rooted history has influenced my connection to gardening and food because of the direct correlation to my family, both past present and future, that I otherwise wouldn’t have. It’s in my blood. If you drive past our childhood home not too far from where I live now, you’ll see about twelve years' worth of Christmas trees (my mom would only buy live trees) planted along the hillside where my sister and I used to run and play. They’re huge now of course, but looking at them and thinking of the Christmas mornings that we gathered excitedly at their edge with family members and gifts and a roaring fire- thats the good stuff. Those memories are now planted on that hillside for a lifetime. It's like this secret story that only we're privy to. Another sweet story is that when my mothers parents (my Nana and Papa) were living in Cleveland, my Mopsi (great-grandmother and mother to my mothers father) was living here in California. Both my Nana and Papa loved Gardenia and Mopsi grew them in abundance. Each year on my grandparents anniversary, Mopsi would clip and individually hand wrap each bloom in a moistened paper towl and then tin foil and send them as a gift. My mom says that she can vividly remember them opening that box each year and my nana setting those blooms out around the house to be enjoyed. From the environment of your home and yard, it is evident you put an emphasis on providing a space for your family, friends and community to gather, eat, celebrate and be. Why is it important for you to hold this space? As a child I remember being drawn to places of comfort. A loved ones lap, a cozy chair with a fluffy throw and a warm fire, a beautiful outdoor space. The engagement of all four scenes meant comfort to me. Smells, textures, visuals and sounds. Food was comfort, the home was as expression of love. Hospitality was a huge part of my Nana’s life, and now mine. She is who I most mirror when it comes to creating a space or an environment, so I see a lot of her here in my home now. She loved beautiful things, as do I. I love hosting and gathering here. Attention to detail and the conscious effort of layering creates an authentic experience and space to both live in and for others to visit and enjoy. My greatest hope when someone visits our home that they leave feeling like they know me better than they did before they came, like they had a glimpse into my soul. Our home is a reflection on who I am, my truest self. 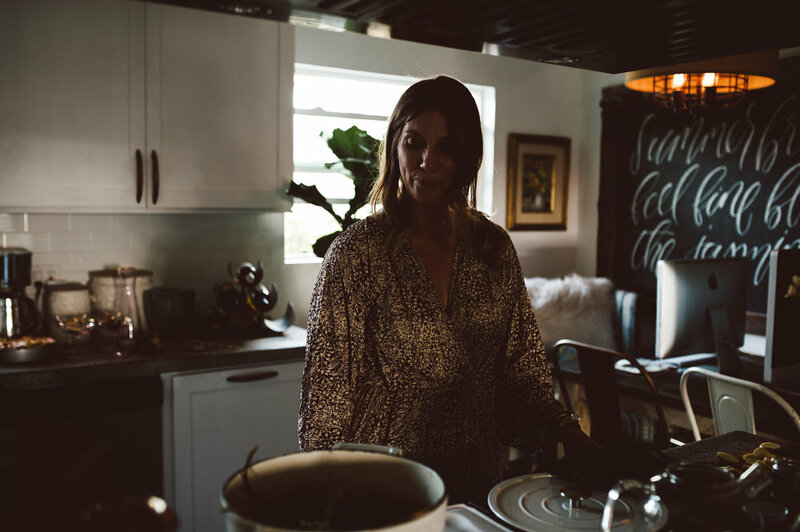 During our time with Corey she served us a beautiful simple and warming soup prepared from several of the vegetables and herbs grown in her garden. You can find her recipe below. 1. Brown sausage links in a sauté pan. 2. Cut links in half lengthwise, then cut slices. 3. Place sausage, chicken broth, garlic, potatoes and onion in slow cooker. Add just enough water to cover the vegetables and meat. 4. Cook on high 3-4 hours (low 5-6 hours) until potatoes are soft. 5. Mix flour into cream removing lumps. 6. Add cream and kale to the crock pot, stir. 7. Cook on high 30 minutes or until broth thickens slightly.